"It was easy to work with GetDucks.com...."
Had a great hunt, best ever. It was everything you said. Had a great hunt, best ever. It was everything you said. I would like to THANK YOU at GetDucks.com for all your help. I’ll definitely be back for years to come. Just got off the airplane back from Argentina duck hunt at GetDucks.com’s Las Flores and wanted to drop you a quick note. In 11 trips duck hunting Argentina, this was by far the very best ever. The shooting was fast and furious, usually shot my 50-duck limit within a half-hour. Some mornings had my limit in 20 minutes. There were periods of time I couldn’t load my gun quickly enough. At least 95% rosy-bills, it was utterly amazing. Lodging was excellent and food was great. I booked 5 days and stayed 3 days extra this trip, let’s talk about my going back down there again in July. And for sure I’m booking 14 or more days next year. Mongolia duck hunting was an awesome nomadic hunting adventure on the vast Asian steppe. 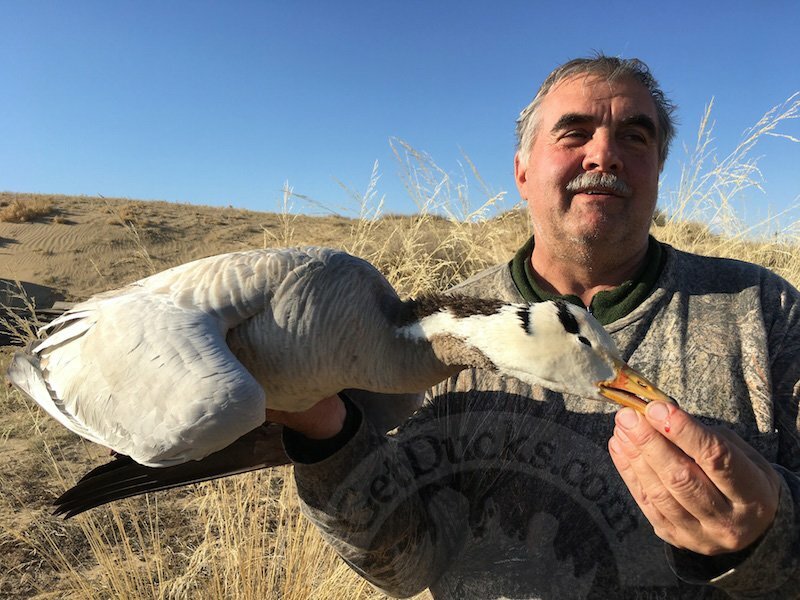 Mongolia duck hunting was an awesome nomadic hunting adventure on the vast Asian steppe. A wandering duck hunter’s dream trip, we got the waterfowl species I was really after. This was my 4th duck hunting trip organized by Ramsey Russell’s GetDucks.com (previously Alaska king eiders, Netherlands goose hunting, Pakistan duck hunting), and am already looking forward to the 5th. No telling where in the world we’ll go next! South Africa duck hunting…easily described as a “trip of a lifetime” but I don’t think that it was our only visit! 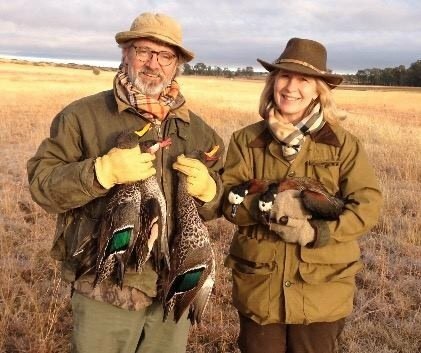 A couple of years ago, my wife took me on a waterfowling trip to Alaska for my 50th birthday, so I was under considerable pressure when hers came around. South Africa duck hunting could not have been a better choice. We spent an enchanted week with gracious hosts at their beautiful lodge. South Africa is a beautiful and interesting country with an abundance of wildlife and a spellbinding history. And the wingshooting? I must say that I have never seen a greater variety of opportunities anywhere. 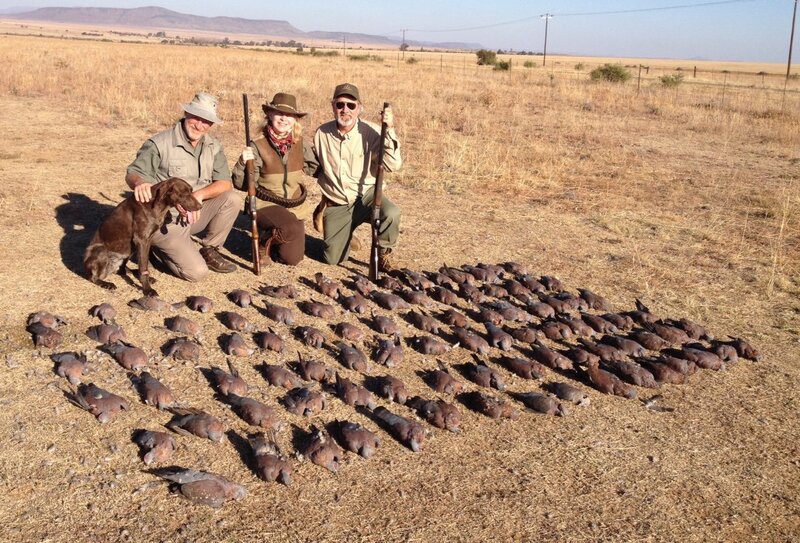 A typical day might involve an early hunt for Egyptian and spurwing geese, a mid-morning hunt for driven guineafowl and francolin, a break for lunch and an afternoon shoot for hot-gun doves or pigeons. I can easily describe this experience as a “trip of a lifetime” but I don’t think that it was our first and only visit! 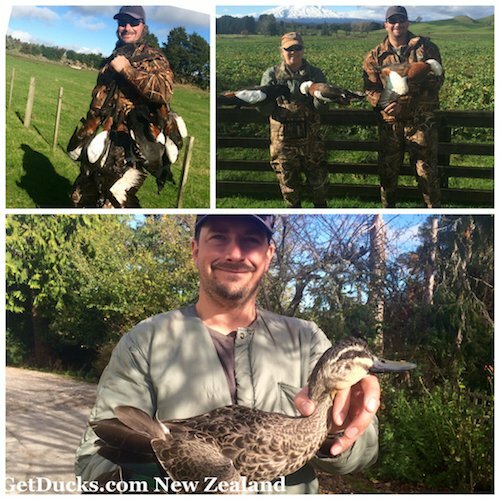 New Zealand duck hunting was truly a fantastic trip made all the better by our hosts. The trip was nothing short of spectacular. New Zealand duck hunting was truly a fantastic trip made all the better by our hosts. The trip was nothing short of spectacular….once the flight was out of the way (ugh!). Certainly no lack of birds, and we had bagged all the birds we were after by the second morning. Ducks, geese, pukekos, and even pheasants just came out of the woodwork. Paradise shelducks are just about the coolest bird I’ve ever hunted…kind of like dumb geese. Bagged some really cool mallard/grey duck hybrids, too. The food and hospitality were absolutely top-notch. I certainly didn’t lose any weight, and Sheryl and I had a blast just staying up late BS’ing with our hosts and probably drinking way too much beer, wine and port. Awesome trip that we’ll never forget. You’ve got another winner. In the meantime, we’re trying to figure out a cool trip for next season. Sheryl wants to try Obregon…wouldn’t take much arm twisting to get me to go. I’d like to go someplace to hammer specklebellies. Or we may just pull the trigger and do another Argentina trip. Life is full of tough decisions. 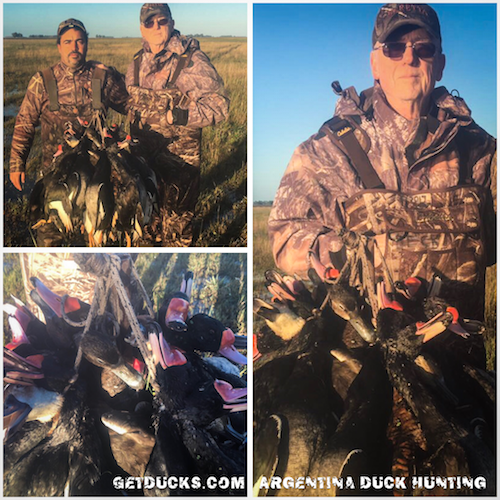 This Rio Salado Argentina duck hunting operation is truly one of the great duck hunting destinations in the world…exceeded my expectations. The recent email that Chris sent really summarizes our Argentina duck hunting trip most accurately. Ramsey, the trip was everything you represented and exceeded my expectations. Whereas I thought our little boys would shoot a couple of boxes of shells in the course of a morning hunt, I was so proud to hear them banging away in the distance going through whatever number of shells had been suggested for that mornings hunt. I was amazed to see them harvesting 25 to 40 ducks considering that they only shot at ducks and killed a few at our farm for the first time last Christmas. It shows that their natural ability and passion for shooting can really begin to pay off when starting so young. 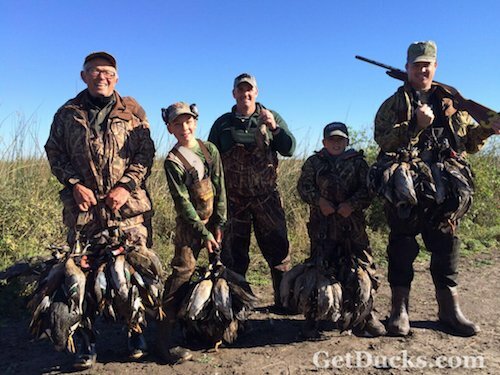 This Rio Salado Argentina duck hunting operation is truly one of the great duck hunting destinations in the world. Also I’ve had many translators in many places in the world I’ve traveled internationally, but I have to say you are truly blessed to have Martha as part of your team. One day I asked her if she actually thinks in English because her comprehension and understanding is excellent. She can read an expression on a client’s face and then already begin to have a solution or answer on the tip of her tongue. Also I appreciate her having gone into the field with us on a few occasions. It allowed us to learn more about the experience and talk to our guide through her. As for the future I will be staying abreast of you through your website and hope to be able to participate in another one of your GetDucks.com adventures in the future. 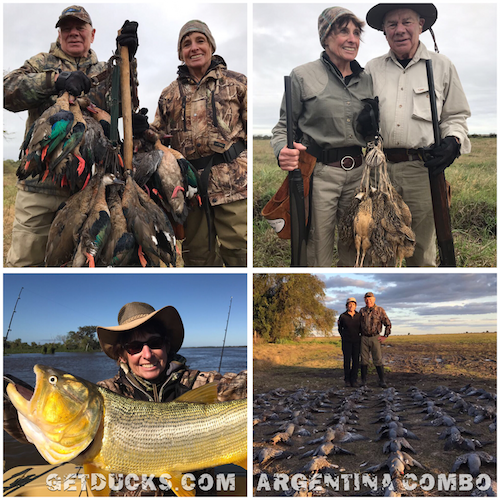 Argentina duck hunting trip at Rio Salado with my family was the trip of a lifetime in a truly beautiful and wild location. We feel blessed to have been invited to experience this special place. Dear GetDucks.com Team, WOW! What else can I say? 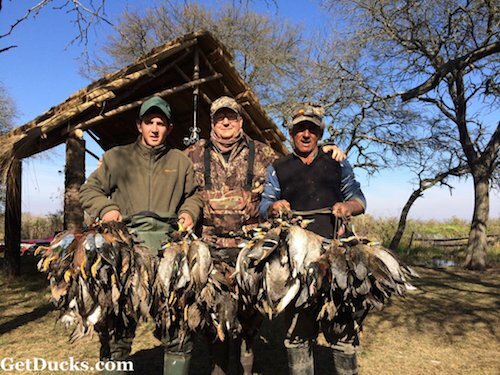 This Argentina duck hunting trip at Rio Salado with my uncle, brother-in-law and 2 young sons (10-12) was the trip of a lifetime in a truly beautiful and wild location. We feel blessed to have been invited to experience this special place. The hosts Martha and Fede were gracious and made us feel totally at home. The cooking staff did a great job, delicious food and nobody left the table hungry. Our guides were amazing, hardworking men and I totally trusted them with my boys; I truly felt a bond with these men. These guys were complete professionals with great personalities, my boys and I will miss them. I came to realize that Ramsey, Anita, David, Martha and Fede and the guides are all key parts to making this adventure what it is, spectacular. In missing any part of that equation would change the entire experience. •The views, the sunrises and sunsets. •Hunting each day in this beautiful place with my family. •The late night talks with Fede. •Playing soccer with my sons and the guides. I pray I can come back some day and may God bless the staff at GetDucks and Rio Salado. The Rio Salado Argentina duck hunt was as advertised: it was a total experience. The lodge was in the boonies, the number of ducks was off the charts. 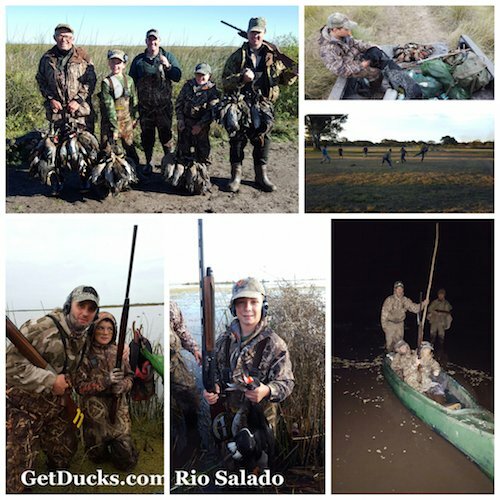 The Rio Salado Argentina duck hunt was as advertised: it was a total experience. The lodge was in the boonies, the number of ducks was off the charts. Guides were excellent. GetDucks.com staff took care of everything. I felt well taken care of.